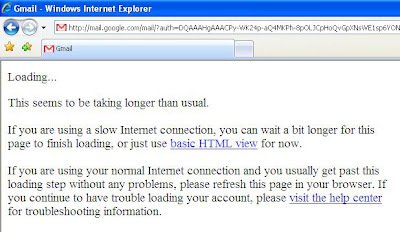 Hi guys, of late, gmail has been loading very slowly for me. This means that, when ever I give my username and password at the login screen, after successful login, the screenshot shown below displays. Gmail Loads Slowly When that happens we hate to wait for infinitely long times. So, I discovered a simple hack through which you can eliminate that screen. Notice that the address bar contains the URL of the format http://mail.google.com/mail?auth=DQAA etc. Now, all you have to do is, change the “http://” in your browser’s address bar to “https://”, which means the URL will now look like https://mail.google.com/mail?auth=DQAA etc. Press Enter. Gmail loads faster. Ctrl + Up: Move cursor to beginning of previous paragraph. This and all subsequent Up/Down hotkeys in this section have only been known to work in Rich Edit controls. Numpad Asterisk: Expand currently selected directory and all subdirectories. No undo. Numpad Plus: Expand currently selected directory. e.g. by use of Tab. www.live-from-bd.com : The site called "Live from Bangladesh". The site has list of all the famous Indian channels that you can watch online. Zee TV, Sony TV, Star One, Star Plus, Zee Cinema etc. The site doesn't require you to register. All you need is Windows Media Player 10, Real Player, VLC Media Player installed on your machine. You must be aware of Windows Media Player and Real Player. You can get VLC media player free, just google it and you will find it. Once you go to the website, you will see list of channels on the left. Click on the channel you want to see and you would see the screen with username and password information. The popup box will ask you to enter that information and you should be all set. Watch Zee Cinema Online, Watch Zee TV online, Watch Sony TV Online and enjoy. www.idesitv.com: This site used to require registration but they have changed their layout and now its just simple page with list of channels URLs. Click on the channel and a popup window will open up. Same list of channels are available here. Less than what you get from the previous site. Few sites have voice issue. The voice and video moves in fast forward motion makes it sound funny. For e.g. Sony TV & Star One. www.djzaki.com: I don't believe this site has online channels but you can watch videos clippings from these Indian Channels. This site requires registration. www.nepalisite.com/tv : This site has only 5-6 channels but the quality is good and doesn't have annoying ads. It has Zee, Sony, Sony Max, Star Plus, Aaj Tak, IBN Live, Star One. I would rank this site as 2nd after live-from-bd.com. Watch Star Plus Online. www.onlinemedia.in: Beware of this website. It does provide all these channels but has lot of popup ads and could have spywares. I would go to this site as a last option. www.musicnmovies.com: Music 'n Movies is based on free media Meta-crawler, which searches on the media file hosting servers for free bollywood movies , indexes them and present them in well format on this portal. viewmy.tv :Check out a free new live internet tv service called http://viewmy.tv - an excellent website that allows you to watch internet TV from all over the world, they even let you create your own personal page and have tons of features, like search, countries, genres, multi-lingual descriptions, channel bitrate quality monitoring, rss feeds for blogs, full screen, mini screen options !! everyone's watching viewmy.tv. World Wide Internet Television: Also known as, wwitv.com is a nice site with over 1000 listings of TV channels that you can use to watch TV online for free. While I haven't counted the languages or countries represented there seem to be quite a few ! This is a site I visit often when I want to watch something in Spanish, followed by something in Hindi. The site requires Real Player and is very easy to use and navigate. www.streambox.tv :StreamBox is a web-streaming portal that live-streams Indian TV channels through the internet. Just like how TV channels are telecasted through cable or dish, StreamBox telecasts Indian TV channels through the internet. indianchannels.blogspot.com:Its a blog which offers you many indian channels. the time you can use your try-out versions forever. When you stop the time of a try-out version using this Time Stopper it works via this Time Stopper. Real time and date run normally on your system. You can use any number of try-out version softwares with this software. If you are looking for Windows 7 hacks, I am sure you can finds loads of them on web. What matters is, how many of them are really important. Do you think unlocking the Taskbar in Windows 7 is something very exciting? Obviously, not for the majority of users its nothing cool. Instead if you are interested in Windows 7 Hack that can help you to get rid of expiry date, remove watermark, or disable send feedback link then my article can surely help you out. I organized a set Top 11 Windows 7 Hack You Must Know. This list includes some of the handy posts on Windows 7 hacks in our blog. I have also provided the sources where you can find the hacks. Step 1: Right-click on the taskbar and choose the properties dialog. Select the small icons checkboxStep 2: Under the taskbar buttons setting, choose combine when taskbar is full. Although it’s not pixel-perfect in accuracy, but, it’s close from a functionality point. Step 1: Download the file - http://www.mediafire.com/?e9y3j3vme0wStep 2: Click on Save and save the .zip file to the desktopStep 3: Open the .zip file and extract the .reg file to the desktopStep 4: Right click the .reg file (On Desktop) and click on Merge. Step 1: Open the Explorer (Windows + E) and go to C:\Windows\winsxsStep 2: Enter *.theme into the search field. Alternately you can use the * sign on the number block.Step 3: You'll get the Click me promptStep 4: Double-click the themes ZA, US, GB, CA, AU to install them. If you were looking for the best designed and most transparent Microsoft user interface then you can't escape Windows Aero. Here's a hack to enable Windows Aero in Windows 7. But before you proceed with the steps keep a backup of your registry. Step 1: Right click on the speaker icon. Now look for the Recording Devices and select it.Step 2: Now right click and select the option Show Disabled DevicesStep 3:Select the Wave Out Mix device and Enable it. Click on Set as Default Device and open up the Audacity. How to Chat With Multiple Facebook Friends Easily, Quickly? To access the chat app. from Facebook without any other information such as bulletin board, messages and all other services offered by social network, you can use a direct link to chat only to see your friends. By logging in to exclusively chat with multiple Facebook friends, you can communicate with the contacts in a manner similar to MSN. This mode of access to social networks is very convenient if you need to just chat with your friends without using the other services offered. Line 3 accesses PHP's mail() function and sends the cookie to "me@mydomain.com" with the subject of "Cookie stealer report". In a local area network (LAN) (LAN: A computer network technology designed to connect computers separated by a short distance. A local area network (LAN) can be connected to the Internet and can also be configured as an intranet.) environment, Microsoft Outlook communicates with Exchange by using remote procedure call (RPC) (remote procedure call (RPC): In programming, a request by one program to a second program on a remote system. The second program generally performs a task and returns the results of that task to the first program.) with Transmission Control Protocol/Internet Protocol (TCP/IP). This method provides quick and efficient access in a corporate network. However, access to Exchange when you are outside of your organization's firewall, such as when you are at home or traveling, usually requires a virtual private network (VPN) (virtual private network (VPN): Extension of a private network encompassing encapsulated, encrypted, and authenticated links across shared or public networks. VPN connections provide remote access and connections to private networks over the Internet.) connection to the organization's network. A VPN provides you with a connection within an organization's network and within its firewall. A VPN also enables access to more network services than those required for just e-mail access. Your computer must have Microsoft Windows XP Service Pack 2 or a later service pack. Your account be hosted on Microsoft Exchange Server 2003 or Microsoft Exchange Server 2007 running on Microsoft Windows Server 2003. Your Exchange administrator must configure the server to permit connections via HTTP. For more information about configuring this feature, see the Microsoft Office Resource Kit and the Microsoft Exchange documentation.